We are a family riddled with food allergies. In just our immediate family we have allergies to dairy, wheat, eggs, nuts, tomato and garlic. We also share environmental allergies, allergies to many medications and two of us suffer from eczema and sensitive skin. Needless to say things can and do get very expensive around here from food to special creams and numerous specialty doctor visits. One thing that is very important to families with food allergies is to cook all foods from scratch. You can imagine how time consuming and tedious this can be. Especially if you have an extremely busy schedule. We've tried to buy allergy friendly foods in the past, but they can become expensive and they usually have very poor nutritional value if any. I have been playing around with some of my recipes to convert them to fit our food allergies (listed above) and would like to start sharing some of them because they have helped us out a lot. These are recipes that our whole family can eat and really enjoy. Some recipes include some store bought items. Please read all labels of any product you buy to make sure it fits your families needs. 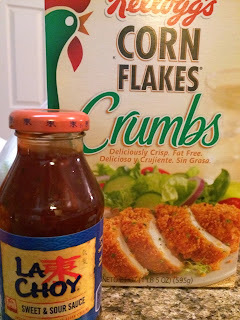 Cut chicken into equal sized pieces and place corn flake crumbs on a plate. 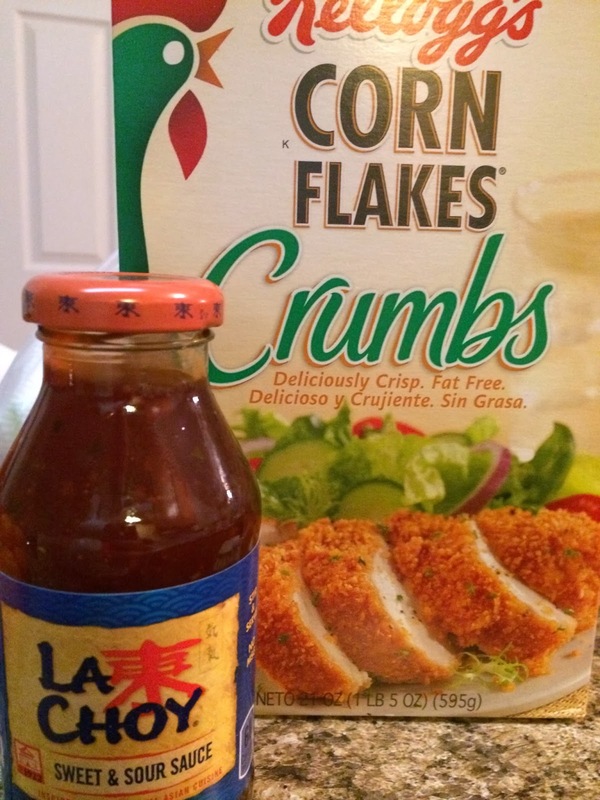 Place chick in corn flake crumbs and coat evenly. *Pour you olive oil into the pan so the bottom is completely covered. Turn heat on the medium high and let the oil heat up before putting in the chicken. 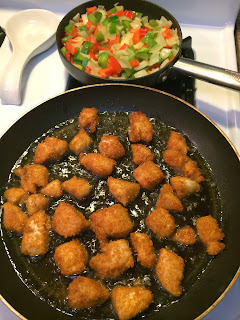 Place Chicken into pan. You will know when to flip the chicken when you start to see the pieces turn white around the edges. 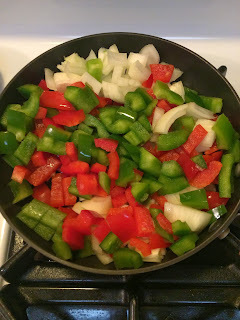 Here is a picture of what the vegetable and chicken should look like in their pans. 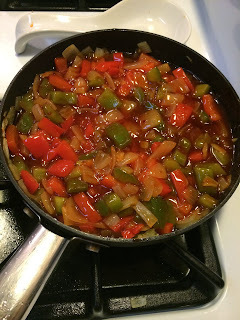 Onions should be translucent and peppers should be soft yet crisp. Chicken should have a nice crispy brown appearance. Always cut into your thickest piece to check for doneness. Add Sweet & Sour sauce to the pepper and onions, let warm slightly. Take chicken out of pan and transfer to a plate covered with a paper towel to soak access grease. If you chose to make a side of rice add all ingredients together and enjoy. Remember to always read food labels and make substations when necessary. 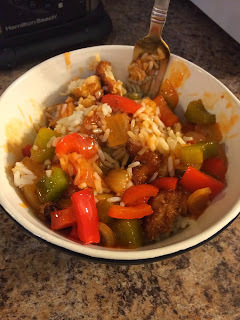 I really hope you enjoy our allergy free sweet & sour chicken. What is your families favorite allergy friendly home cooked meal? While your here you should check out our Wal-Mart Gift Card Giveaway… very easy entry.